Feng Meng Vue, otherwise known as sloslylove, is an exciting new electronic artist based out of Eau Claire. His newest release, Tendencies, was released on tape and digital only, being a huge fan of the analog format. His throwback use of synths and large dancey soundscapes are impressive for such a young artist. Vue will be joined by fellow Eau Claire natives, Sayth & Wealthy Relative, two wordsmiths making their 7th St debut this Wednesday. The two budding hip-hop artists have taken the University of Minnesota scene by force, winning the 2013 Battle of the Bands, ousting Hippo Campus and opening for Earl Sweatshirt. Forke’s production on many of the tracks is a culmination of years worth of beat making and is considered a master lyricist. Dan Mariska, Minneapolis singer/songwriter will be headlining 7th St this Thursday night. Mariska is no stranger to the stage, headlining and supporting shows at 7th St since 2012, winning over Minneapolis audiences with his intimate sets, and his likeness to other indie-pop stars including Ben Gibbard and growing up on indie-emo tunes has shaped his vulnerable singing. Though his new material crosses alt-country and hypnotic indie-pop-- he is surely an act not to miss. Nick Costa led rock band The Person & The People will be co-headlining, bringing their bedroom rock to the Entry for their first headlining gig, previously supporting and playing in the popular Tribute to the Replacements. 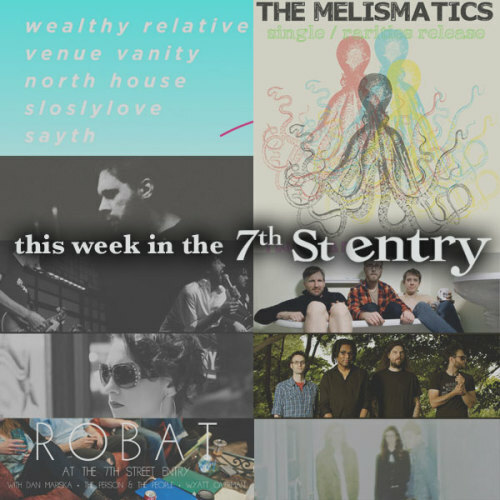 This Friday in the Entry we will be indie rock group The Melismatics. Many will recognize the name from the many Replacements Tributes they have played in here at the Mainroom. They are Lollapalooza and CMJ veterans, whose work has been featured on many MTV shows, led by husband-wife duo Ryan and Pony Smith. Their group is commonly described as post-punk and classic indie rock, but consistently draw large crowds from their famously high-energy shows and relentless touring. The group has worked with Semisonic frontman and songwriting aficionado Dan Wilson. Opening will be local groups Two Harbors and the exciting Max Timander-led Stereo Confession, who put on one of the best Entry shows of 2014 a few months ago. Minneapolis trio Buildings will be helping co-headline this Saturday’s Entry event, featuring all Midwest acts, including Chicago group Pink Avalanche and Twin Cities group Waveless. Buildings’ most recent effort, Melt Cry Sleep was released through douleplusgood records this past year, bringing a far more abrasive and dynamic sound to their music. Four-piece Pink Avalanche will be bringing their noise rock to the stage as well for the first time, with firm underground rock roots involved with their retro-rock soundscapes. Minneapolis’ Waveless will be bringing their grunge/garage rock to round out the night, performing behind their self-titled debut EP. Sunday night will feature an all-local lineup, consisting of indie-rocker Bartell, as well as the always hard-hitting Iguano, and singer Vonnie Kyle. This will be Bartell and Iguano’s debuts at the Entry. Bartell is an experimental rocker based here in Minneapolis, most recently was nominated for a song of the year by The Current, of his fantastic track “Tiramisu”. Joining will be muddy rockers Iguano, known for their high-energy dark rock shows. Vonnie Kyle, no stranger to 7th St, will be performing with his band, to perform tracks from her 2013 record, Run Run. She has both headlined and supported previously here.